Is Acupuncture Right for You? is regarded by many practitioners as the most concise and useful book to introduce prospective patients to the principles, processes, and benefits of acupuncture. One of the oldest healing therapies known, acupuncture has now become a popular and recognized alternative to Western medicine, particularly for the treatment of chronically painful conditions. While Western medicine manages conditions primarily with drugs and/or surgery, acupuncture focuses on treatment of the person as a whole by identifying and relieving energetic imbalances and blockages throughout the body. Addressing these disruptions in the energy flow, or vital force, of the body treats not only the physical symptoms but also the underlying cause of the ailments. Ruth Lever Kidson explains the fundamental principles of traditional Chinese medicine that underlie acupuncture and how practitioners use this information to make their diagnoses and select treatment options. Using case histories of acupuncture patients, she shows what to expect from a consultation and treatment session and also offers advice on how to find a good practitioner. Anyone considering acupuncture for treatment of a health condition will find their questions answered and their concerns allayed by this invaluable book. In Western medicine both diagnosis and treatment are usually based upon a part of the body. For example, a diagnosis of a broken bone will be followed by treatment of that bone by putting it in plaster, and a diagnosis of an irregular heartbeat will be followed by treatment of the heart with drugs to regulate its rhythm. A patient diagnosed with gallstones is likely to have his gallbladder removed and, with it, the stones. However, removing a patient’s gallstones does not treat their initial cause. While the stones do not re-form, since the gallbladder is no longer there, the imbalance that originally created them has not been cured by the operation. In Chinese medicine the aim of treatment is not just to alleviate the illness itself but to do so by removing its cause. Acupuncture, like many other complementary therapies, is a way of restoring the body’s energy flow to a normal state so that the body can get on with the work of healing itself. When there is a deficiency of Chi, yin, or yang, the system must be stimulated; when there is an excess it must be reduced. Heat, cold, wind, damp, dryness, or phlegm must be eliminated from the body, and stagnant blood must be set flowing again. Imbalances among the meridians must be remedied by drawing Chi into a deficient meridian from one that has excess. If there is a blockage of Chi flowing along the course of a single meridian, this must be unblocked. Each meridian’s points have specific functions relating to the transfer of energy. The element points have already been mentioned in chapter 3. In addition, each meridian has a source point by which it is linked to its organ. Thus, the source point on the Lung meridian may be used to treat the lung itself, that on the Kidney meridian may be used to treat the kidney, and soon. Some points are specific for dispelling the various external factors: heat, wind, cold, damp, dryness, and summer heat. Others have particular effects on yin or yang, either stimulating or sedating. Each of the major meridians--except that of the heart--has one or more intersection or meridian connection points by which that meridian is linked to others. These points are useful for the treatment of conditions in which several meridians are affected. The choice of points to be used in treatment is very complicated. The acupuncturist must know the function of each of the points on each of the meridians, along with the nonmeridian extra points. He must know how the meridians interact with each other. He must know how to eliminate invasive conditions, such as cold and heat, from the body. He must know how to restore balance to the system and how to stimulate it to function normally once more. And, ideally, he must be able to do this while using a minimum of needles. People are often worried at the thought of being stuck full of needles. But the skill of a trained acupuncturist lies in knowing how to treat a condition using the fewest possible acupuncture points. Often a patient may be treated with no more than four or five needles, and, indeed, sometimes a single needle will be enough. Five correctly chosen points will produce results just as good as ten. In the next chapter a variety of illnesses is discussed and a number of points listed that might be used in the treatment of each of them. In some cases there may be a large number of suitable points, but these would not all be used at the same time. However, where there is a wide range of equally appropriate points and where the treatment is carried out over a period of weeks or months, the practitioner might use all of them in rotation. Of course, treatment need not necessarily involve the use of a needle.Although needling is probably the easiest, most effective, and therefore most popular way of stimulating the acupuncture points, it is not the only one. Other methods are widely used, such as acupressure, moxibustion, and cupping, both to complement acupuncture and in cases where needles are inappropriate (for example, in the treatment of young children). Despite the various ways of stimulating acupuncture points, the most common form of treatment--and the one that everyone has heard of--is the insertion of needles into the points. When people who are not familiar with acupuncture therapy hear about needles being stuck into patients, they invariably think of hypodermic needles, injections, and, consequently, pain. Because of this they are often unable to understand how acupuncture can so frequently be quite painless. But there are two main reasons why injections are painful, and neither applies to acupuncture. First, because a fluid has to be passed down a hypodermic needle, the needle is hollow. As it enters the skin, it cuts out a tiny section and pushes it deeper into the tissues, causing pain. Second, the fluid is subsequently injected into the tissues, and because there is no natural cavity there to receive it, it compresses the tissue cells and nerve endings. This too is painful. An acupuncture needle, on the other hand, is very fine. It is not hollow, nor is anything forced down it. Thus its insertion feels quite unlike an injection. The length of time that a needle is left in the patient depends on the practitioner and on the treatment being given. Sometimes it is only appropriate to leave a needle in for a second or two, but needles maybe left in for a period of ten minutes or more. Once they have been inserted, however, the patient usually feels relaxed and comfortable and doesn’t find the treatment in any way unpleasant. In fact, in the hands of an expert, patients have been known to feel so relaxed that they have dozed off. Ruth Lever Kidson qualified as a doctor from St. Mary’s Hospital Medical School in London and has studied a wide range of complementary therapies and, at present, is retraining as a psychotherapist. She is the author of Hypnotherapy for Everyone and A Guide to Common Illnesses and lives in England with her husband, who is a homeopath. "Acupuncturists--this is the book to have in your waiting room. My patients love it and many come early for their appointments in order to read a few pages. It covers all the basics of acupuncture in an engaging style rich with anecdotes and case histories. A joy to read!" "If you are feeling the need to transition from, or complement, your Western medical treatments and want to know about acupuncture, you will find that this book addresses most every question and concern you may have about acupuncture." " . . . regarded by many practitioners as the most concise and useful book to introduce prospective patients to the principles, processes, and benefits of acupuncture. . . . 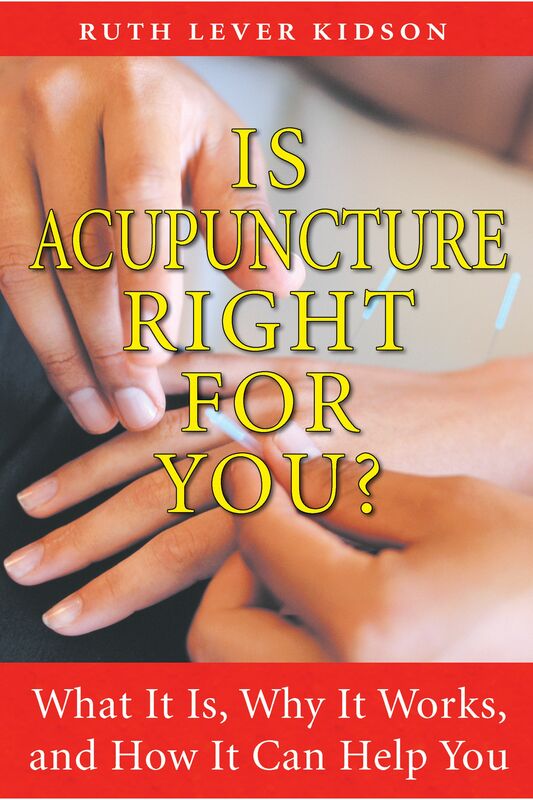 Anyone considering acupuncture for treatment of a health condition will find their questions answered and their concerns allayed by this informative book." Book Cover Image (jpg): Is Acupuncture Right for You?